Millions of people are affected by incontinence and bedwetting, and the conditions are not discriminate of age or gender. Urinary incontinence is a condition that causes the involuntary leakage of urine, one which has a profound impact on quality of life for people everywhere. Some studies show that as many as 1 in 13 adults are incontinent, and 1 in 5 children will bed wet. Though incontinence is a common medical condition, many people still feel embarrassed to seek advice and discuss treatment and incontinence products – such as waterproof mattress covers – that can better their situation and alleviate them of worry. There are numerous causes of incontinence. Generally, it is divided into four categories: stress, urge, functional and overflow. Incontinence products are effective at treating most of these categories, but the key is to identify why incontinence is occurring to find the best method of treatment. Stress incontinence is mainly characterized by pelvic muscle weakness. This category of incontinence results in small losses of urine with coughing, sneezing, exercise and laughing, among other movements. Urge incontinence is the involuntary loss of urine through a sudden urge, for apparently no reason. Urge incontinence most often occurs during sleep or when the person hears running water. Functional incontinence occurs when the person does not realize they need to use the bathroom, or becomes disoriented about how to find the bathroom in time. The cause of functional incontinence typically arises from people suffering from confusion or dementia, brought on by diseases such as Alzheimer’s and Parkinson’s. Functional incontinence is also closely associated with age, as it is prevalent among the elderly. Overflow incontinence is a category that includes people who feel they cannot stop their bladders from eliminating constantly or for a while after urinating. Overflow incontinence occurs when the bladder is consistently full and therefore frequently leaks urine, typically caused by weak bladder muscles or a blocked urethra. This form of incontinence can be diagnosed early due to a slow stream of urine when going to the bathroom. Bed wetting in children is mostly attributed to one cause and is seen as part of growing up, and there are many methods for treatment. Bed wetting, unlike other forms of incontinence, is sporadic and normal in younger children. Bed wetting is a widespread form of incontinence, affecting five to seven million families a year in the U.S. and Canada. Although it is common, it still creates stress and trauma for both parents and children. Children feel a sense of shame, while parents feel as though they have somehow failed. Bed wetting affects children of all age groups, and can often continue into puberty. For all types of incontinence and bed wetting, it’s important to diagnose the condition by visiting a specialist in the field, or an urogynecologist. The urogynecologist will perform numerous tests to identify the cause of the incontinence and a physical examination to detect any medical conditions that may be attributing to incontinence. After diagnosis, there are various treatments for incontinence, many of which revolve around various exercises to strengthen pelvic muscles. There is also bladder training techniques and a variety of medications that can inhibit urinary incontinence. However, one of the most important concerns with incontinence and bed wetting is how to deal with the issue on a daily basis. Incontinence does not have to affect your quality of life or disrupt your normal activities. There are a variety of incontinence products, such as waterproof mattress covers, that can assist in leading a life that is not ruled by incontinence. Though, finding the effective and discreet incontinence products is of great concern for many people, which is why Protect-A-Bed® is the chosen source of incontinence products worldwide. Protect-A-Bed® offers a full line of waterproof mattress covers that are especially useful for incontinence sufferers. Our incontinence products are discreet – the mattress protectors are made of a super soft, ultra-thin, lightweight material that is waterproof, absorbent and easy to transport. 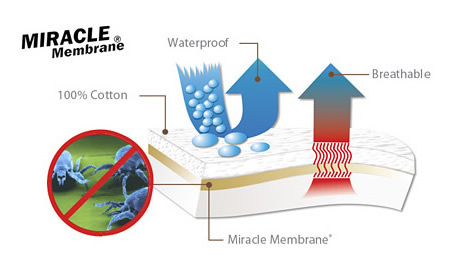 The waterproof mattress covers feature Miracle Membrane™ durable polyurethane laminate, which provides ultimate protection for your mattress, yet is cool, comfortable and quiet to sleep on. Protect-A-Bed® waterproof mattress covers are machine washable, can be wet, sterilized and tumble dried. Protect-A-Bed® waterproof mattress covers are discreet and can be transported easily for overnight stays or your child’s next sleepover. At Protect-A-Bed®, we are committed to providing the incontinence products that help you live as though incontinence is not an issue. For the millions of people who are incontinent, Protect-A-Bed® provides solutions to help protect your bedding while at the same time hopefully reducing some of the stress and trauma associated with the condition.